Antibodies are protein molecules used to by the immune system to combat pathogens. They have a multitude of functions in the body; antibodies can bind to antigens to prevent cellular damage, activate the complement pathway to destroy a pathogen, or mark a pathogen for destruction by NK cells. They are an integral component of the humoral immune response. Scientists had figured out how to harness the natural antibody response when they discovered vaccines as a means to guard against contagious diseases. Using their physiological properties, researchers have been using antibodies as reagents in a multitude of assays and tests. Antibodies are also being used by clinicians as a treatment modality. There are two primary types of antibodies, monoclonal and polyclonal. These antibodies are classified by the means in which they are created from lymphocytes. Each type of antibody has its role in the immune system, diagnostic exams, and treatments. This paper will describe the synthesis of monoclonal and polyclonal antibodies, their differentiating properties, and their role in clinical diagnostics and therapeutics. What is the difference between a monoclonal and polyclonal antibody? It is essential to know the process of how antibodies are made to understand how monoclonal and polyclonal antibodies are different. The creation of antibodies occurs by the linking of four two light chain and two heavy chain polypeptides by sulfide bonds. When the chains come together, they will look like a ‘Y.’ The two heavy chains connect to form the Fc region (at the bottom of the Y), and each light and heavy chain is forming the Fab region (the two top prongs of the Y). The Fc region determines which of the five classes of antibody will be active. All antibodies begin as IgM or IgD, and can remain as that isotype or become IgG, IgA, or IgE antibodies. The antigen binding site forms by the combination of both the light and heavy chain at he ends of the Fab section. This site can also be called the variable region. It is where the antibody will bind to the unique identifying section of the antigen, the epitope. This site can change its amino acid structure by a process called somatic hypermutation, which allows for a greater variability of antibodies. Initiation of the immune response begins while the B cell lymphocyte is presented with an antigen. These lymphocytes will be able to multiply and differentiate into multiple B cells. As the B cells multiply, somatic hypermutation will alter the formation of amino acids and will change the variability of the antigen binding site. These initial B cells will produce antibodies that have what is called an immature antigen binding site, where it does not fit perfectly to a given antigen. As each lymphocyte multiplies, the antigen binding site will begin to develop towards a formation that will optimally capture the antigen by constructing a complementary binding region. The B cells that fail to mature towards the antigen structure will die via apoptosis. Eventually, the lymphocytes will evolve to bind to the antigen specifically. These B cells will create plasma cells that will predominately produce antibodies while a small subset of cells will become memory B cells, lying dormant until the antigen presents itself the second time. If inactive memory B cells recognize the same antigen again, they will activate and produce mature antibodies that will quickly and accurately bind to the antigen. The purpose of illustrating the role of the antibody in the immune response will help clarify the origins of the polyclonal and monoclonal antibodies. During the first initial exposure to an antigen, the antibodies created from the multiplying lymphocytes are classified as polyclonal antibodies. As the B cell differentiates each colony of cells will produce antibodies. The antigen binding sites of these antibodies are not entirely matured yet, so these polyclonal cells have the unique ability to bind to multiple epitopes of the antigen at the same time. The specificity of these cells will be lower than a fully matured cell, but the sensitivity will be higher as the chance of binding any epitope will be higher. This higher sensitivity can also lead to a signal that has a higher chance of being amplified because more than one antibody can bind and multiple epitopes. This phenomenon describes the concept of avidity, which is greater in the polyclonal cells. In a physiologic setting, having a high avidity can be beneficial in capturing antigens. An escape mechanism of antigens is its’ ability to change the structure of its epitope to avoid detection by the immune system. A polyclonal cell line would perform better than monoclonal antibodies to bind to an escaping antigen. Another benefit of polyclonal antibodies is when they bind to multiple epitopes on an antigen, their Fc regions lie closer in proximity and are more likely to activate the complement pathway. A disadvantage of polyclonal cell’s variability is that the antigen binding sites have higher incidences of cross-reactivity, where the antibody can falsely bind to another epitope and create a false positive result. In vivo, the antibodies can mistakenly recognize the host as a non-self antigen and try to mount a response. When a plasma cell secretes antibodies with a mature antigen binding site, it will exhibit a monoclonal antibody cell line. The antigen binding sites for all of the antibodies will be molecularly identical and will target a particular epitope of an antigen. Once the memory B cell is activated, it will multiply and produce identical antibodies at a higher rate than an initial exposure to an antigen. This highly specific antibody-antigen binding domain will have minimal cross-reactivity and false positives when compared to polyclonal antibodies. The monoclonal antibodies have some disadvantages. First, they have higher incidences of false negatives due to an inability to capture an epitope if there are small mutations in its structure when compared to polyclonal antibodies. Second, monoclonal antibodies activate the complement pathway less frequently than their polyclonal counterpart due to the greater distance between Fc regions of the bound antibodies. The use of antibodies in the clinical and laboratory setting forced scientists to create ways to produce both polyclonal and monoclonal antibodies for large-scale production. Polyclonal antibodies are cheaper to produce than monoclonal antibodies and can be performed by a less skilled technician. The process involves inoculating an immunized animal. Different animal antibodies can be used to limit the problem of cross-reactivity. In the laboratory setting, rabbits, goats, and sheep are the most popular animal choices. However, chickens, donkeys, and pigs can be used if a lot of antibodies are needed. 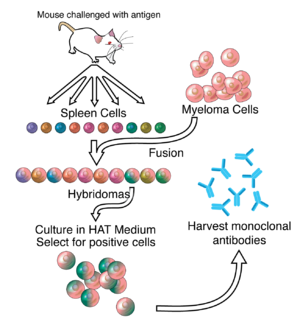 Once the antigen is selected, it is purified to limit cross-reactivity and then it can be bound to a larger protein to enhance the success rate of immune presentation. Then, the antigen is injected into the animal and the technician waits for an immune response. Periodic blood draws are taken to monitor antibody levels in the animal. Once antibody levels are sufficient, a blood draw is performed, and the blood is centrifuged down until the polyclonal antibodies can be isolated and purified if needed. Once the immune response for the animal is passed, no more antibodies can be collected. If the researcher needs more antibody for their project, they would have to re-inject the animal and await another immune response. As a result, each batch of polyclonal antibodies will have a lower yield and a greater variability than that of the monoclonal antibodies. This variability of the antibodies in solution makes the polyclonal antibodies more resilient and able to better tolerate minute changes in their environment and less likely to denature. Polyclonal antibodies recognize multiple epitopes on a single immunogen and are composed of several immunoglobulin subtypes. They can be used in multiple applications including Western blots, ELISA, and IHC. We guarantee that your polyclonal antibody produced in any host will have an ELISA titer of 1:32,000 or better if peptide antigens were designed, synthesized and conjugated by NeoBioLab. For any protein antigen (3 mg, >80% purity, 90% preferred) we guarantee a polyclonal antibody with positive Western blot results and an ELISA titer of 1:32,000 or better for any host. We will restart the project free of charge until our guarantee is met. Interested in our Polyclonal Antibody prodcution services? Click here for an instant quote. The production of monoclonal antibodies differs significantly from polyclonal antibodies, being that it is more expensive and requires an extremely skilled laboratory technician. The basis of monoclonal antibody production stems from the initial discovery of the antibodies in serum samples in multiple myeloma patients. In the mid- 1970’s, a breakthrough occurred when Köhler and Milstein devised a method to create monoclonal antibodies. Köhler and Milstein received the Nobel Prize for their work. Similar to polyclonal antibody production, the process begins with an injection of the desired antigen into an immunized animal. Once the animal develops an immune response, B cells are isolated from the animals spleen. The B cells are fused with myeloma cells, creating hybridomas. This step provides the immortality of the cell line. Once created, a hypoxanthine, aminopterin, thymidine (HAT) solution is used to incubate the hybridomas. The solution will destroy the unfused myeloma cells preventing competition for the hybridomas. Once incubated, the hybridomas are screened to see if the desired antibody is being produced. Once identified, these hybridomas are separated and allowed to multiply. The finished culture will be able to produce monoclonal antibodies for eternity. The process of identifying the correct monoclonal line can take up to a year to produce the antibodies of choice. Once the line is selected, the antibodies will never have to be created again because of the immorality of the hybridomas. Monoclonal production produces a higher yield of antibodies compared to polyclonal production methods. A problem with the monoclonal line stems from its homogeneity. Small changes in the culture, temperature, buffer composition or pH can cause the antibodies to denature. Another criticism of this method is that it can take significantly longer than polyclonal antibody production and is more expensive. NeoScientific is a leader in custom monoclonal antibody development. Our antibody team strives to deliver successful projects to customers in the most cost-effective way. Our monoclonal antibody service delivers on the most difficult projects. We have created antibodies for numerous applications including functional assays, immuneprecipitation, IHC, IF, flow cytometry, Western blot, and EIA. Interested in our Monoclonal Antibody prodcution services? Click here for an instant quote. Based on the different characteristics of monoclonal and polyclonal antibodies when should each one be used? Diagnostic tests and assays provide the best use of polyclonal antibodies due to their ability to recognize different epitopes of a target molecule. Polyclonal antibodies are also the ideal reagent in hemagglutination reactions because the binding of antibodies to multiple epitopes facilitate precipitation out of solution when compared to monoclonal antibodies. The best use of polyclonal antibodies is when the exact nature of the antigen is not known and would provide a more sensitive test. Indirect ELISAs, Western Blots, and microarray assays use polyclonal antibodies as a secondary antibody. Their role is to bind to different epitopes and amplify the signal, leading to better detection. Monoclonal antibodies are often used as primary antibodies in immunoassays because of their ability to specifically bind to epitopes. Through the use of clinical application, some of the disadvantages of using each type of antibody has been nullified. Companies can purify polyclonal antibodies to limit the degree of cross-reactivity in their assays. The combination of monoclonal antibodies leads to the capture of multiple epitopes and expanding its’ specificity. Where monoclonal antibodies have stood out in a clinical setting is their ability to find and target specific molecules. Monoclonal antibodies Fc regions were initially tagged with markers and were used to discover cellular surface components. This research has further branched out into monoclonal antibodies being used a treatment modality. Muromonab-CD3 was the first antibody approved by the FDA in 1985 as an immunosuppressant for organ transplant patients by inhibiting a T cell response, preventing host versus graft disease. The binding of the antibody to the T cell’s CD3 receptor inactivates it, preventing cellular destruction. In the thirty years since the discovery of Muromonab-CD3, researchers have been able to identify other epitope targets for monoclonal antibody binding. The FDA has a approved forty-one other antibodies to fight cancers, rheumatoid arthritis, and asthma among other illnesses. Monoclonal antibodies are also being used as vectors to bring treatments to the cancer cell. Using the Fc region of the antibody, the chemotherapy or radiated particles are attached. Once bound to the cellular target, the antibody is phagocytosed, releasing the treatment particle and causing intracellular damage. Polyclonal antibodies are not as adept as monoclonal antibodies at treating cancer cells due to their lack of specificity and a high degree of cross-reactivity. Research is showing that polyclonal antibody therapy can be useful in the treatment of some diseases and as an immunosuppressant for transplant patients. Antibodies are unique in their ability to bind to epitopes and perform an array of physiological tasks, including amplifying signals, isolating structures, and destroying of antigens. Discovering their use in clinical and scientific modalities, monoclonal and polyclonal antibodies have proven to be essential in the discovery, quantification, and elimination of their targets. The choice to use a relatively inexpensive polyclonal antibody that can bind to multiple epitopes or an expensive monoclonal antibody with high specificity is dependent the characteristics of the job. To declare one lineage of antibody better than another is an incorrect statement; both monoclonal and polyclonal antibodies have their role in the scientific community and will be integral to future discoveries and breakthroughs. (2003). Immunoassay of infectious agents. Bio Techniques, 34(4), 850-859. Dadachova, E., Pirofski, L., & Casadevall, A. (2004). Passive antibody therapy for infectious diseases. Nature Reviews Microbiology, 2, 695-703. Gagnon, P. (2012). Technology trends in antibody purification. Journal of Chromatography A, 1221, 57-70. Hendriksen, C., & Hau, J. (2002). Production of Polyclonal and Monoclonal Antibodies. In Handbook of Laboratory Animal Science, Second Edition: Essential Principles and Practices, Volume I (pp. 391-413). Boca Raton: CRC Press. Kohler, G., & Milestein, C. (1975). Continuous cultures of fused cells secreting antibody of predefined specificity. Nature, 256, 495-497. Leenaars, M., & Hendriksen, C. F. (2005). Critical Steps in the Production of Polyclonal and Monoclonal Antibodies: Evaluation and Recommendations. ILAR Journal,46(3), 269-279. Lipman, N. S., Jackson, L. R., Trudel, L. J., & Weis-Garcia, F. (2005). Monoclonal Versus Polyclonal Antibodies: Distinguishing Characteristics, Applications, and Information Resources. ILAR journal, 46(3), 258-268. Lubberts, E., Koenders, M. I., Oppers-Walgreen, B., Bersselaar, L. V., Roo, C. J., Joosten, L. A., & Berg, W. B. (2004). Treatment with a neutralizing anti-murine interleukin-17 antibody after the onset of collagen-induced arthritis reduces joint inflammation, cartilage destruction, and bone erosion. Arthritis and Rheumatism,50(2), 650-659. Mahmud, N., Klipa, D., & Ahsan, N. (2010). Antibody immunosuppressive therapy in solid-organ transplant: Part I. Mabs, 2(2), 148-156. Posnett, D. N., McGrath, H., & Tam, J. P. (1988). A Novel Method for Producing Anti-peptide Antibodies. Journal of Biological Chemistry, 263(4), 1719-1725. Ritter, M. A. (2000). Polyclonal and Monoclonal Antibodies. Diagnostic and Therapeutic Antibodies (pp. 23-34). Totowa, NJ: Humana Press. Weiser, A. A., Wittenbrink, N., Zhang, L., Schmelzer, A. I., Valai, A., & Or-Guil, M. (2011). Affinity maturation of B cells involves not only a few but a whole spectrum of relevant mutations. Internation Immunology, 23(5), 345-356. Zabriskie, J. B. (2009). Immunological Techiques. In Essential clinical immunology(pp. 21-33). Cambridge, NY: Cambridge University Press.